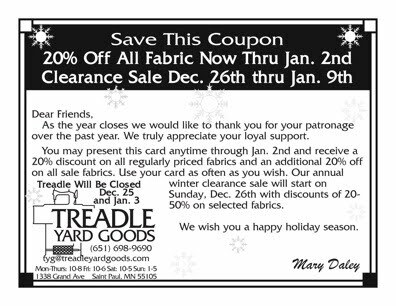 Coming this Thursday, December 2nd, the Treadlettes are having a little sale. Come by to see what we all do in our time away from the store. 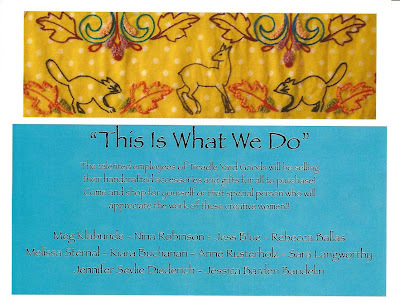 We all sew, but some of us also knit, weave, make jewelry, bead, embroider, and much more. 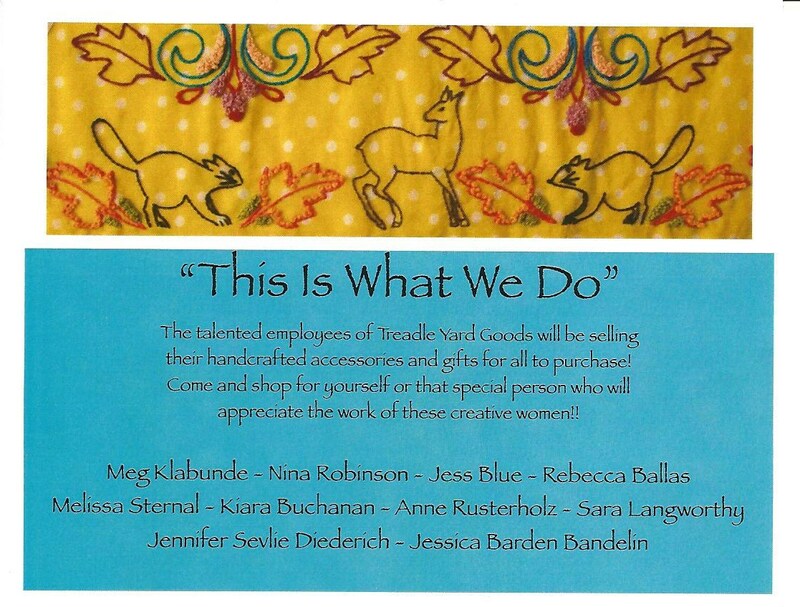 Our wares will be available to purchase at Treadle 2 on Hamline Ave, just around the corner from our main entrance. Our giveaway winners, as randomly chosen by the random number generator, are Comment #5 and Comment #18. So, congratulations Tanya and Nicole! Tanya wins the copy of Seams to Me, and Nicole wins the copy of Handmade Beginnings. Thank you all for playing along, I hope you all have lots of fun with your projects, we always love to hear what people are making! Don't forget to join our flickr group, to get your photos featured here on the Treadle Blog! Our fearless leader, Mary, bought many, many gorgeous fabrics at the International Textile Show in September. These wonderful fabrics need to go to good homes now to make room for new fabrics which are arriving daily. Enjoy savings of 20% on all in stock fabrics and an additional 20% on all sale fabrics. Get a head start on your holiday sewing, or treat yourself to that fabric you’ve been lusting after. The sale runs from Friday, November 26, through Sunday, November 28. We will be open our regular hours - Friday, 10 a.m. to 6 p.m., Saturday, 10 a.m. to 5 p.m., and Sunday, 1 to 5 p.m.
We have just received some of Anna Maria Horner's new line Innocent Crush. These velveteens are crying out to become a cozy fall skirt, or a couple of soft pillows for you couch, can you hear them? Also, we have some new colorways of Anna Maria's Square Dance. The past incarnations of this fabric were printed on a textured, dobby fabric, this time around the print is on untextured voile. To celebrate this great influx of Anna Maria's fabrics, we're giving two lucky readers a copy of one of Anna Maria's Books - Handmade Beginnings or Seams to Me. This giveaway is open to Twin Cities residents only. All you have to do to enter is leave a comment here, and I'll randomly choose the winners next Friday, November 26th. Tell us what you're sewing, tell us about your stash, let us know how you feel about the recent snowfall. Happy Sewing, and best of luck! You guys have been coming through big-time with some beautiful sewing on the Treadle Yard Goods flickr group and I have a few to share here. First, we have this lovely ensemble from Julia at minecreations. She made the Eclair Dress from Colette Patterns, and it is just beautiful. As a bonus, she had enough silk left over to make a matching tie for her fiance! As we are nearly half-way through November, it's also a good time to talk about holiday sewing. We have a fine example here - Jenna made this advent calendar out of wool felt. This looks like a great way to use up scraps hanging around the house! We do so love to see what you're sewing! Head over to flickr and share your photos too! It's time for Book Review Corner again! Seams to Me and Handmade Beginnings. Seams to Me is a manual for beginning sewing, and Anna has some great chapters about choosing the correct fabric, finding the right tools, laying out patterns and beginning sewing techniques. This book has a nice mix of whimsical and practical projects. I would love to make this art piece, what fun! There are clothes for youngsters, clothes for grown-ups, and fun accessories. Handmade Beginnings is full of more wonderful patterns, many of which are for the pampering of the prospective and new mother. Anna also has included patterns for clothes and accessories for the new baby and even some projects for elder siblings so they feel included in all of the family excitement! Both of these books have an envelope of patterns in the back, and they are spiral-bound, so they stay open while you're working, a big plus for me. 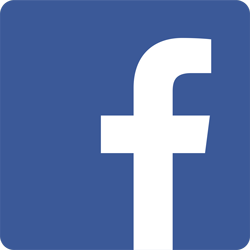 If you have used any good, or not so good, sewing or crafting books lately, drop us a note in the comments. We're always looking for more books to highlight in our Book Review Corner! Stop in for a look at our selection of Halloween Fabrics, now reduced 40%! We have many fun and spooky patterns, perfect for a trick-or-treat bag, or fun holiday-appropriate napkins and place-mats! I have a jam-packed post for you today! First of all, the last day of our sale is tomorrow, so come on in. You know you want to. Second, we have these terrific pieces from the new Vogue catalog, all designed by Katherine Tilton. These patterns are quite versatile Pattern #8691 was used for both the gray and brown tops, and #8690 for the v-neck tops. We have this pattern in a solid and a stripe which really highlights the interesting lines in the top. Along with these fascinating pieces, we have so much new fabric, I don't quite know where to start! Yesterday our favorite UPS driver brought the new fabric from Liesl Gibson at Oliver + S.
We have 8 cotton prints, and 9 knits. These fabrics have the same whimsy that we expect from the Oliver + S line of patterns, and they feel terrific! I may have to make myself a top, they're all so cute! and we are set up for the fall! It's Oliver + S trunk show time! 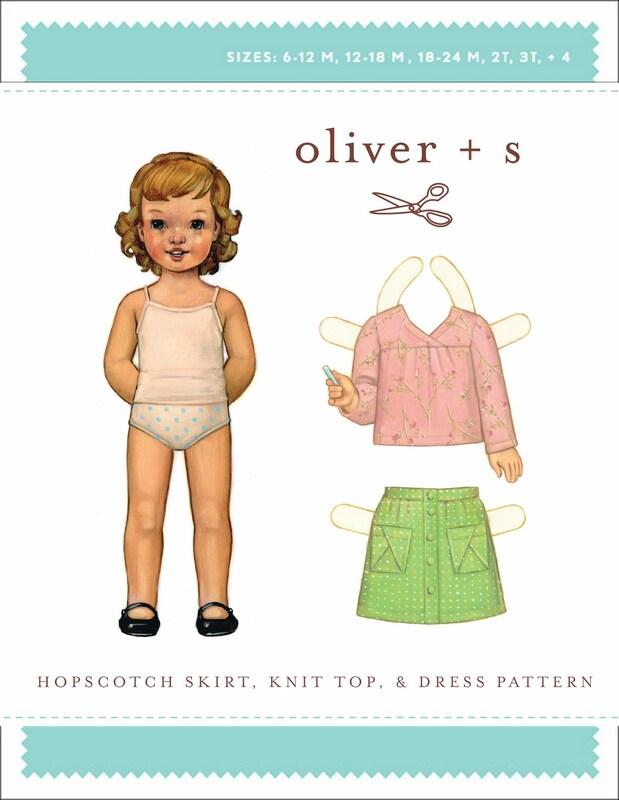 We have a small selection of their newest patterns, which also show off the new line of Oliver + S fabrics. 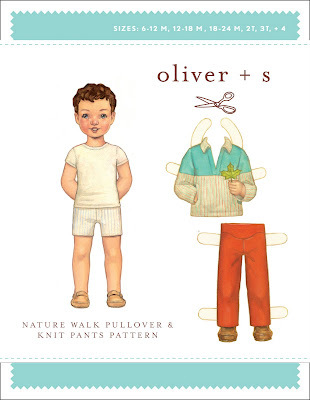 I just found out about a wonderful resource on the Oliver + S website. Learn to Sew with Oliver + S.
Liesl Gibson, the creative force behind Oliver + S, has taken pattern writing to the next level, and really wants to educate new sewers. 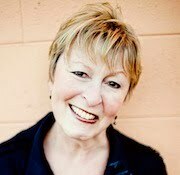 Please go and take a look at her syllabus, it's great information and you'll have a wonderful new wardrobe for the youngster in your life at the end of it! Please come on in and join us for our Annual Fall Sale, September 30-October 10. We'll have 20-50% off all fabrics in the store. On top of that great news we'll also be showcasing many of the fine patterns from Oliver + S, as we'll have their trunk show starting soon. We have some new fabrics in the store that should be of particular interest to children, or people with children, or people who used to be children. These new fabric lines from Robert Kaufman and Quilting Treasures are sure to inspire a little picturebook nostalgia in us all. Robert Kaufman brings us a line of delightful Dr. Seuss prints. From Horton to the Lorax, and the Fox in Sox to Sam I Am, all of your favorite characters are represented here. There are multiple colorways, and a nice variety of patterns. Quilting Treasures has delivered a line of fabrics inspired by the Little Golden Books. We have the familiar back-cover pattern, as well as a panel to make a Saggy Baggy Elephant soft book. What better way to introduce a new generation to this classic story? As well as being awfully fun for quilting, these patterns would be perfect for teacher's gifts, or classroom bulletin boards. These are going fast, so come on in and take a look! I mentioned about a month ago that Oliver + S was coming out with some new patterns. A more delightful collection you will be hard pressed to find. It really is difficult for me to decide which one to make first. but I am also very drawn to the Hopscotch Skirt. It is difficult to choose, but I think this dilemma is the best one to have! Don't forget to stop in for a look at the Decades of Style Trunk Show. These beautiful garments will be on display until the 19th! 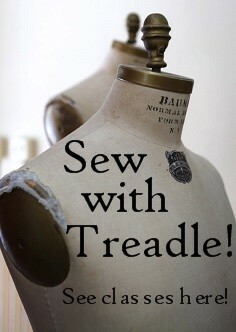 Treadle is currently displaying the Decades of Style Trunk Show. Stop in to check out these fabulously stylish designs. The Trunk Show will continue through September 19, 2010, during which time all Decades of Style patterns will be discounted 10%.